Dantin: We have a serious problem on our hands. all of the warriors have died in battle, and still the masked warriors come. Juan zi Nobie: Bring the last of the warriors. Dantin: Didn't you hear me say "all"? We are going to have to use common people to fight now! And they won't even have enough time to be trained. We cannot lose this battle! Juan zi Nobie: I see what you are trying to say. But if the warriors can't beat them, then how are the commoners supposed to? Dantin: Hopefully if we send enough, one just might make it through to the end. Juan zi Nobie: Sacrifice lives like that! Here is what I am going to propose. You are the best Ductorian Warrior living. If you train a new True Ductorian Warrior we might just have a chance. Dantin: Training takes time. There is no possible way I could train a person in time. Juan zi Nobie: Hmm. Yes, but if the person has natural talent, you should be able to train him with plenty of time. Dantin: Where are we going to find this person? Juan zi Nobie: I suppose we should bring commoners in and put them through training. Those who cannot handle it, we must send them home. And those who pass with room to spare, we will work to find the best of them all. The Interviews: Ductorians interview several bizarre creatures, and some rather normal ones. Interviewer: What is your name, sir? Interviewer: Um.. do you speak any language that's understood by... anyone? Interviewer: And what is your name? Interviewer: Um... Can you use that hand? You might need it. Interviewer: Can you even talk? Interviewer: Umm, are you able to fight in battle? Interviewer: Uh, hello sir. What is your name? Interviewer: What is your species? Interviewer: Oh!, okay. ...How fast... can you run? Gnomey: I am the fastest runner on my planet and I am most fierce warrior! Interviewer: How fast can you run, though? Interviewer: You didn't answer the question. Gnomey: -- and I am most fierce warrior! Interviewer: Uh... Has your planet ever won any wars? Gnomey: We have won every war! Interviewer: Next. Get up and leave. Tuey-Gooey: My name is Tuey-Gooey. Interviewer: And... are you good at fighting in battle? Tuey-Gooey: Fighting's not good. I like to spread peace to people around the world. Interviewer: Uh, what-- what are you? Interviewer: Uh, alright... What are your qualifications? As he talks, Midget says "iwannabeaDuctorianwarrior!!" Interviewer: Sorry, sir, what was your name again? MiV: Oh, uh, my name is, Uh.. um... uh... MiV. MiV. Interviewer: Okay, MiV, why do you want to be a Ductorian Warrior? MiV: Cuz... I want to fight for the common good of everyone and be a goodguy, because the goodguys always win and I want to be on the winning side. Interviewer: Hm... go behind the curtain, we'll get to you. Interviewer: And why would you like to be a Ductorian Warrior? Christo: Because, I enjoy fighting, and I feel that... I think I would do a good job. I always wanted to be a True Ductorian Warrior. I think it would be so, so much fun. Interviewer: Get behind that curtain. We'll get to you. Dantin: So you guys are the best? Christo: Well, yeah, I guess so. MiV: We're the best of the best. We're the best at what we do! Dantin: And what exactly is that? MiV: Uh... just tell us why we're here. Dantin: Do you both wish to be True Ductorian Warriors, and take on the responsibility of that position? MiV: Yeah, what he said. Dantin: And accept that death may be the result? MiV: Yeah, for the bad guys. Dantin: I'm liking Christo much more now. Remember, MiV, no one is invincible. Dantin: Training starts tomorrow at five. Christo: Oh, I can make it. Christo is shown asleep on a bed. MiV comes bounding in. MiV: Time to get up! Rise and Shine! Training starts now! Let's Go! MiV: Okay, well I'll just tell Dantin that you're not up to the challenge. Christo gets up and they go outside. Cut to outside training grounds. 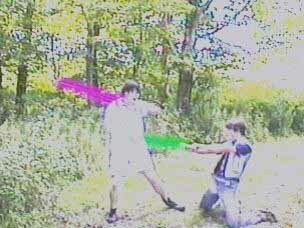 Dantin and MiV finish practicing, and turn off their duct sabers. Christo: Hey guys, what's up? Christo: (to Dantin) So what are we gonna do, training? Dantin: Yeah. First I'll let you try the single blade. They turn on the duct sabers. Christo and Dantin spar for a while. MiV: Hey! You wanna try my double-ended duct saber? Christo and Dantin spar for a while longer. Christo makes a bad move, and then stands up clumsily. Dantin points his duct saber at him. Juan zi Nobie: They're both showing signs of true skill. Dantin: Yes, especially MiV. Christo's coming along. I'm sure if MiV weren't so amazing, Christo would look a lot better. But I feel both of them are ready for minor battle. Juan zi Nobie: Send them out on the next flight to Shinubi forest on the Masked Empire's planet. Dantin: Minor!? That's a big war you have going on there. Juan zi Nobie: They are the best warriors we have so we must use them for the most influential battles. Dantin: As you wish, but I hope we're not making a big mistake. Juan zi Nobie: Get them ready. On the ship to Shinubi, getting ready. MiV: ...or they might forget! Their ship is shown leaving the mothership and heading for the masked planet. It crash lands on the island of Traken Ico, while various clips of alien life and danbots are shown. The ship flies down to the island a lands near an alien deer, who looks up casually. Christo is shown returning to the ship after the battle is over. He uses the special ball to communicate with Dantin. Christo: Dantin, I'm coming home. Dantin is speaking to the Ductorian people from a high balcony. Dantin: I've come to you to talk about the battle in the Shinubi forest. Six men were sent out: Christo, MiV, and four others. The four were killed easily, but Christo and MiV stayed on. And here is Christo to explain what happened to MiV. Christo: Hi! Um, I'm Christo. Um, well basically, I went to the Shinubi forest with MiV. It was the two of us, and, um, a couple others, and, well basically what happened... is this. Cut to video of the battle with voiceover narration by Christo. Christo and MiV run onscreen and light their duct sabers. Christo (narrating): When we first encountered the dandroids, we expected little resistance. 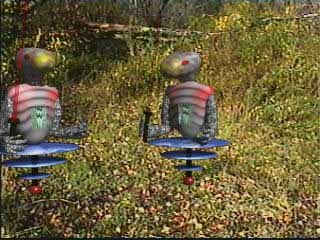 A dandroid is shown moving mechanically and slowly. Christo: Is this a joke? Christo fights the dandroid and destroys it. Christo (narrating): I had at least nailed ten, but MiV didn't even seem to be trying. MiV is shown standing idly. A dandroid comes up to him, seems to recognize him, and backs away warily. He beckons it over and forces it to fight, and they exchange a few pitiful hits, but then MiV says "Go away" and the dandroid does. Meanwhile, Christo is shown taking on multiple dandroids all by himself, destroying one just before another leaps at him, and another, and another. Christo (narrating): Then I met Sanson Hi. Christo goes up to him to fight, but his duct saber is knocked away with the first hit. Suddenly MiV jumps in. Christo (narrating): MiV fought bravely, but I guess it wasn't enough. He died saving my life. MiV is mortally wounded by Sanson Hi. Christo (narrating): After Sanson Hi left, I got out of the bushes to go see how MiV was. MiV is lying on the ground, pinned under the weight of his duct saber. Christo: MiV, are you all right? MiV: No! I'm dying, Christo... take my light saber. Christo takes the duct saber. Christo (narrating): I did everything I could to save him, but I had to bury him right there. A grave is shown, and MiV's voice is heard saying "I-- I'm still alive!" Back at the balcony with Christo in the present. Christo: Well, that's my story, and that's why MiV isn't here with us today. Um... thank you. Applause is heard as Christo goes inside and meets with Juan zi Nobie. Juan zi Nobie: Why did you lie to us? Juan zi Nobie: You did. You lied to us about all that happened. Juan zi Nobie: Tell the story. Christo: This is what really happened. Another flashback, this time the truth. Christo is shown walking through the cornfield. He hears a rustling. We see Christo from the point of view of someone running through the corn. As we reach a clearing and see Christo, he says "Sanson Hi!" Christo fights Sanson Hi but is obviously outmatched. Just as Sanson Hi is about to kill him, another duct saber comes and stops his. We see that it is MiV. Sanson Hi: Ah, master, I am sorry. Christo groans from the ground. Christo: What-- what's going on here? MiV: I am the Masked inVader. Take this; I don't need it. 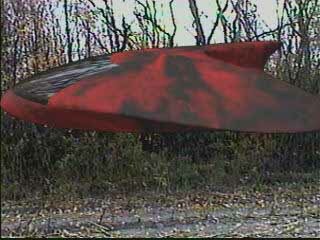 He throws his duct saber at Christo and leaves. Back at the Ductorian planet. Christo: And that's the whole story, that's the truth. Honest, everything's true. Juan zi Nobie: We have a grave emergency on our hands. [to an assistant] Convene the Galactic Council. Juan zi Nobie: The Masked inVader has fled to the planet Tiburon to his secret base. The rest of the planet is desolate. Dantin: Hm. We should destroy the base. Juan zi Nobie: We cannot destroy the base because the planet is protected by a natural energy shield. The only way to destroy the base... is to destroy the planet. Dantin: Send out the duct destroyer ship. Katano gets into the Duct Destroyer ship, and is shown standing in front of a pair of doors. Katano: Initiate Light Speed Jump. Assistant: Initiating Light Speed Jump... starting. The doors slide open to reveal a starfield, which begins to move by at light speed. A red planet swims into view. Katano: We've arrived... Initiate Proton Blaster. Assistant: Proton Blaster warming up... Proton Blaster prepared. We hear the sound of a missile launching, and the planet is shown from space as the projectile approaches it. Suddenly, it explodes into a thousand pieces. 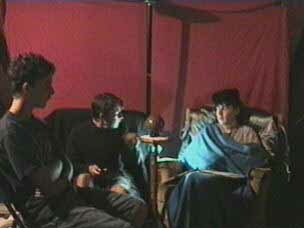 Back at the Ductorian council, Juan zi Nobie is shown receiving a communication through the Special Ball. Juan zi Nobie: I just received word that the Masked inVader's planet was destroyed. Dantin: Good, the Masked inVader must have been on it. Juan zi Nobie: Yes. Assemble the Quarkzar representatives. I want to tell them about the planet. It was in their solar system. Later, a messenger brings a holoimaging device in and sets it up. Messenger: Sir, the Quarkzarian councilmember has left a message for you. Just hit the button when you're ready. Juan hits the button, and a hologram of the Quarkzarian councilmember appears. Juan zi Nobie: Yes, well we have good news and bad news for you right now, it has been necessary to destroy a planet in your solar system. The Quarkzar representative seems upset. Juan zi Nobie: Yes, I understand you're upset. However, we've destroyed the Masked inVader who was on the planet. The Quarkzar representative seems relieved. Juan zi Nobie: Yes, this is good news. Thank you for your time. The Quarkzar representative's hologram vanishes. Christo is shown on the beach, throwing rocks into the water. He takes off his duct vest, which protects him from duct saber hits. The Masked inVader is shown watching him from a distant rock, flaming masked saber in hand. 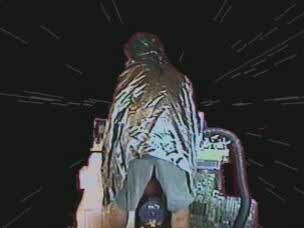 Christo sees him and opens his duct saber. The view pans to the rock again, but the Masked inVader is gone. Christo is shown looking confused, as the Masked inVader rises slowly behind him, his eyes glowing evilly. Chris hears something, and turns around. Suddenly, he wakes up, breathing hard. Christo: I had a dream. In it, the Masked inVader still lived. Juan zi Nobie: I fear that he is still alive. Dantin: There's only one way to find out. Zoom into special ball, where a vision of fighting with the Masked inVader is seen. Christo, Dantin, and Juan zi Nobie are shown with their hands on the special ball, seeing that vision. Juan zi Nobie: It has been decided. The Masked inVader does live. [to Christo] You must destroy him. Dantin takes out a saber handle. Dantin: Use this duct saber. Juan zi Nobie: It is the most powerful weapon in the universe. On the ship to the forest, Christo joins Dantin before takeoff. Dantin: Remember: Our mission is to destroy the Masked inVader. Forget he was ever your friend. On the planet, the battle begins. It is an exciting, pulse-pounding adventure, and Christo and Dantin must fight hard to defeat this great threat. At one point, MiV kicks Christo out of the way and takes Dantin one-on-one. He knocks Dantin's saber out of the way, then strikes him to the ground. With a sweeping motion, he drives the Masked Saber deep into Dantin. 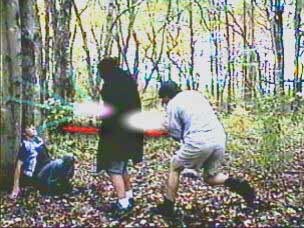 Christo and the Masked inVader fight hard, but Christo's duct saber is lost, and the Masked inVader strikes him down by hitting him on the duct vest, then backs him into a tree. Christo's face is filled with fear, but then he sees something. Dantin's hand, lying prone next to his saber, twitches. Christo's eyes flick back to the Masked inVader, then back to Dantin. The hand twitches again, and then with renewed strength, takes hold of the duct saber and stands up. Just as he is about to kill Christo, the Masked inVader is run through by Dantin's duct saber, and he collapses on the ground, his mask having fallen off. Christo takes the mask. 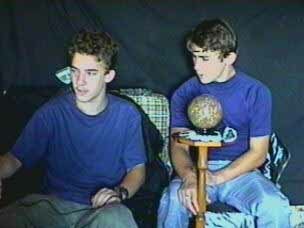 Back at the Galactic Council Chambers, Juan is communicating with Dantin through the Special Ball. Juan zi Nobie: Good, you have destroyed MiV. Invite Christo to join the Galactic Council. I will prepare a place for him. Dantin and Christo have returned, and Christo is now on the Galactic Council. Dantin: I now give you this duct saber. Welcome to the galactic council. Juan zi Nobie: [putting his hand on the special ball] This is the special ball. We use it to communicate with all our Ductorian Warrior across the galaxy. It provides us with important information. Christo: Thank you. ...So, um, what do we do now? Juan zi Nobie: We wait for something bad to happen. Christo: And how long will that take? Juan zi Nobie: We do not know.